I got to try the Roller Derby Elite Alpha skate today. At the $200 price point I wasn't expecting much. After 25 years of trying boots on I'm kind of spoiled as far as what passes my tests. This skate passed my tests. It feels like your putting your feet into pillows. With the larger 110mm and 125mm wheels there's great support to stabilize the skate at the higher height. But, it wasn't to constrictive as I was able to do a full double push on them. They seem to fit true to size for men. My mens Nike running shoe size is a 9.5-10 and the size 10 fit me perfectly. I would go down one size from a womens street shoe size. The liners pull right out of the skate which allows you to throw them in the washer when they start to stink. This allows for easy access to the block area of the boot for customization of the skate. On the 3x125 skate I tried the frame was 10.8" from the center of the front axle to the center of the back axle. The frame had a 165mm, 180mm and 195mm mount. The boot has a 165mm mount. From where the frame comes stock on the boot you can move it one position back. 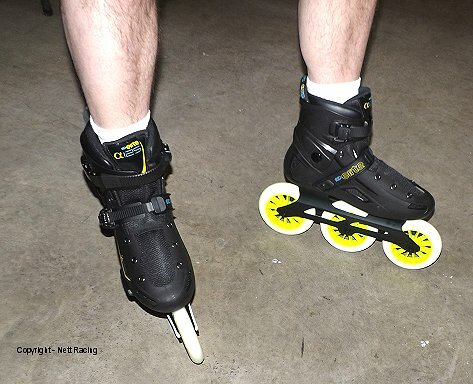 If you have blisters or all the other problems that come with low cut no padding boots this is a great skate to be able to keep your fitness level up while giving your feet a rest. The skate comes with an allen wrench for the frame axles and boot bolts. Like I do with all my higher cuffed boots, I ran them without laces. The upper and lower buckles offer more then enough support, to the point that the laces that come with the boots aren't needed. It makes for getting into and out of the boots super fast. At the $200 price point with 110mm or 125mm wheels I think you'll be happily surprised. Please email: support@nettracing.com with any questions you may have about the Roller Derby Elite Alpha skate.